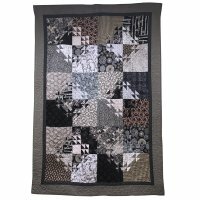 This quilt is a challenge in color, coordination and blending of fabrics. It is a very exciting quilt to make. The actual project consists of a “lot” of half square triangles, 4 patches and large blocks. Jo Ann will guide you through all the processes to help make this easy to put together fairly quickly. 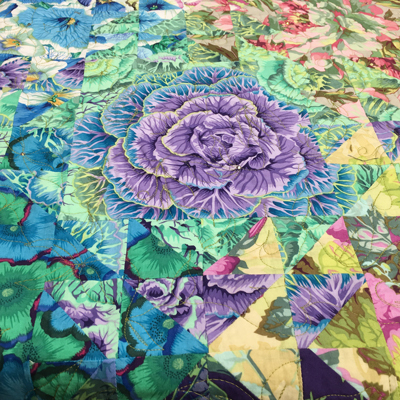 Your quilt in the end will “feel as if you are looking at it through raindrops on glass, or like pebbles in a rippling stream.” It is essentially a scrap quilt. The first part of the class will be devoted to fabric choices and placement. Yardages will be given, but the more choices you have, the easier it will be to complete! So bring lots! 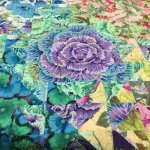 Join Jo Ann in making your quilt Shimmer! She will be on hand for our Class Preview Open House to discuss fabric choices - plan to see her there!